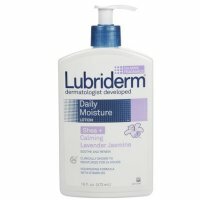 Introducing new Lubriderm Skin Nourishing Moisturizing Lotion with Shea & Cocoa Butters, a formula from the makers of Lubriderm, the brand you know and trust to keep your skin healthy. This blend of shea and cocoa butters will soften and soothe your dry skin, keeping it smooth and supple. Now available with Sea Kelp. Use as directed.